Ordinance No. Page 11 review the plans and adviser approval, approval with conditions, or disapproval in a written report forwarded to the City Council and the applicant. 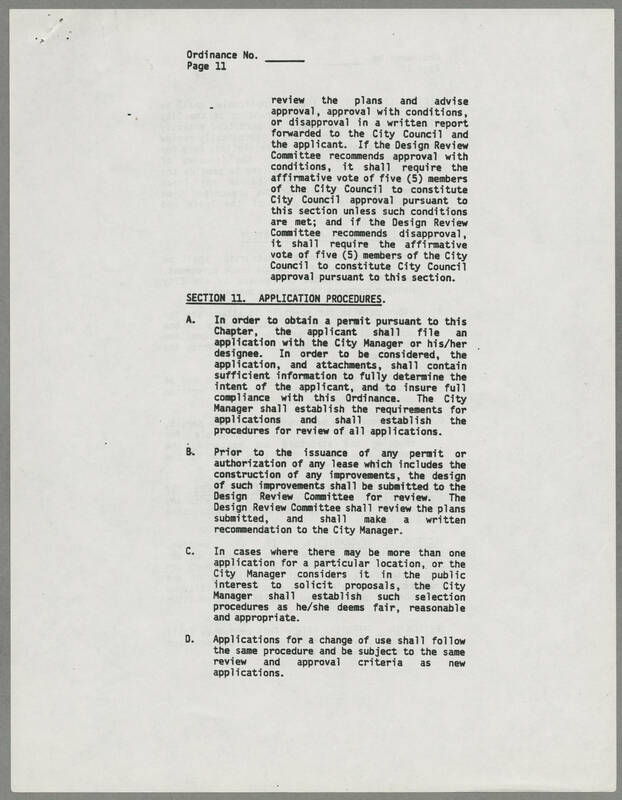 If the Design Review Committee recommends approval with conditions, it shall require the affirmative vote of five (5) members of the City Council to constitute City Council approval pursuant to this section unless such conditions are met; and if the Design Review Committee recommends disapproval it shall require the affirmative vote of five (5) members of the City Council to constitute City Council approval pursuant to this section. SECTION 11. APPLICATION PROCEDURES A. In order to obtain a permit pursuant to this Chapter, the applicant shall file an application with the City manager or his/her designee. In order to be considered, the application, and attachments, shall contain sufficient information to fully determine the intent of the applicant, and to insure full compliance with this Ordinance. The City Manager shall establish the requirements for applications and shall establish the procedures for review of all applications. B. Prior to the issuance of any permit or authorization of any lease which includes the construction of any improvements, the design of such improvements shall be submitted to the Design Review Committee for review. The Design Review Committee shall review the plans submitted, and shall make a written recommendation to the City Manager. C. In cases where there may be more than one application for a particular location, or the City Manager considers it in the public interest to solicit proposals, the City Manager shall establish such selection procedures as he/she deems fair, reasonable and appropriate. D. Applications for a change of use shall follow the same procedure and be subject to the same review and approval criteria as new applications.